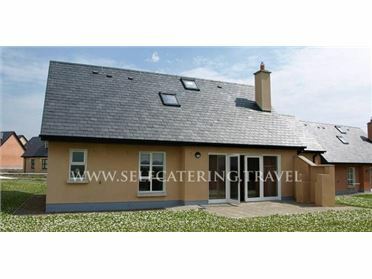 Roundstone is a detached cottage set within a short walk of the village of Tully, County Galway. This cottage sleeps eight people in four bedrooms, consisting of a ground floor double with en-suite shower, two first floor double, one of which has an en-suite shower and a twin, as well as a ground floor bathroom. The cottage also has a kitchen with dining area and comfy seating, a sun room with woodburning stove and a second sitting room with open fire. Outside there is ample off road parking and an enclosed lawned garden with patio, furniture and barbecue. Roundstone is an ideal base for a family or group of friends who wish to explore this part of Ireland. Oil central heating with open fire and woodburning stove. Electric oven and hob, microwave, fridge, freezer, washing machine, tumble dryer, dishwasher, TV with Saorview, DVD, selection of books, games and DVDs. Fuel, power and starter packs for fire and stove inc. in rent. Bed linen and towels inc. in rent. Ample off road parking. Enclosed lawned garden with patio, furniture and BBQ. Sorry, no pets and no smoking. Shop and pub 1 mile. Beach 2 miles..